Lake Travis Getaway is a private waterfront home w/ boat dock located in Spicewood, Texas (35 miles West of Austin) on Lake Travis on a Peninsula formed by the meeting of Colorado & Pedernales Rivers as they flow into Lake Travis in the Naumann Point Neighborhood. The house has 3 bedrooms & sleeps 8 people (1 king, 1 Queen, 1 trundle, 3 twin beds), 2 Full bathrooms, fully equipped kitchen w/ fridge/freezer, stove/oven, microwave, and dishwasher, central air/heat, washer & dryer, 2 flat screen TVs with satellite cable, DVD player,, a selection of books, games, magazines, CDs, & movies. 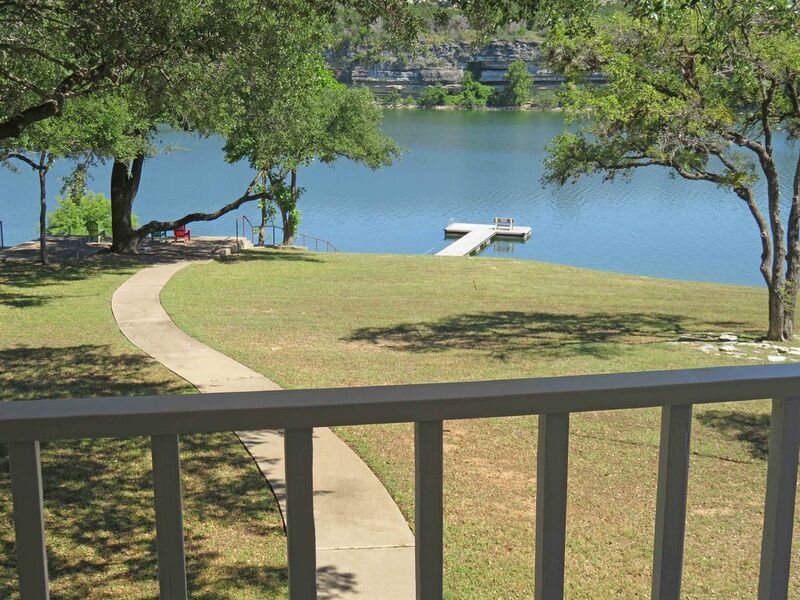 Lake Travis Getaway is equipped with a boat/swimming/fishing dock just steps away from house. This Large lot had over an acre of beautiful waterfront land. Outdoor covered entertainment area with outdoor bar, dartboard, hammock, and lounge chairs. Amenities and Activities: Lake Front with Boat Dock, In-House Massage and Spa Services Available, Stone House Vineyard within walking distance and just minutes from Cypress Valley Canopy Tours. Swim, boat, play all in one place! Play area under house with Tiki Bar for entertaining! Just a short 40 minute drive to downtown Austin, Music Capital of the World, to visit the popular 4th Streert district or 6th Street, go to SXSW, ACL or catch a race at Circuit of the Americas. The Oasis Restaurant is just a short 20 minutes and is a must try. Take the scenic route to Marble Falls and try the famous Blue Bonnet Café as well! Large flat yard with easy walk to the water when at normal levels. Tiki Bar under the house! Great area for entertaining with Margarita's, Darts, Horseshoes, Volleyball and much more! The house and property was clean and well cared for. Everything was as stated in the ad. We really enjoyed this rental. The lake shoreline is at a gradual slope that allows small children to play in the water and still touch bottom. There is a really nice floating dock but make sure you bring your boat fenders as the Wake boats don’t mind passing close to the dock causing large swells to pound your boat. The area under the house is a great gathering place and the balconies provide a great place to relax and watch the wildlife and lake traffic. I would definitely rent this house again. Was just a great location and had everything we needed. This is a lovely little home by the lake for a family getaway. Wonderful view and access to the lake. Clean home. Shops and restaurants not too far off. We really enjoyed our stay. Our group had a great visit. We really enjoyed the patio area downstairs and we utilized the grill. Great space for a weekend getaway. Made great memories with family for my Birthday weekend! Nice house, well kept and very comfortable! Thank you! Would recommend to anyone who is looking for a relaxing time away from the city! Loved it! Thank you Laci! This would have been great had only the weather cooperated. Too cold to drop the boat in and upon further investigation, the closest boat ramp is out of the way. The property owners should try to strike a deal with neighbors. I know we would have been happy to pay for easy access. Since it was cold, we used the open lower level play/bar area for just a bit. It could use a good cleaning and repair of the recreational items, either that or just don't mention them - the place is great without them. We fished from the dock and brought home three keepers: bass, cat and blue gill, and tossed back several small bass. As noted, there was a good selection of books and games with one game (kid charades?) being added to Santa's list this year. The kitchen was well stocked and had everything we needed for Thanksgiving. Great place overall ! Spicewood, Texas is located just 35 miles West of Austin on Lake Travis. While staying at Lake Travis Getaway, you can enjoy shopping in the close small towns of Marble Falls, Johnson City, Fredericksburg, Bee Caves, Lakeway, Austin and more! You can also enjoy local activities such as Wine Tours (3 Local Wineries - 1 in the Nieghborhood), Zip Lining at Cypress Valley Canopy Tours, Powerboat Races in Marble Falls, Formula One Racing at Circuit of the Americas, catch a live concert at the Backyard or even visit Austin, live music capital of the world, for ACL or SXSW. **HOLIDAYS - 3-4 NIGHT MINIMUM** **ALL 3 NIGHTS AT WEEKEND/HOLIDAY RATE** Some Holidays and Events may require a higher nightly rate and higher minimum stay - Please Call.